The paddlefish (Polyodon spathula) is the oldest surviving animal species in North America. Fossil records indicate that the species is older than the dinosaurs, more than 300 million years old. 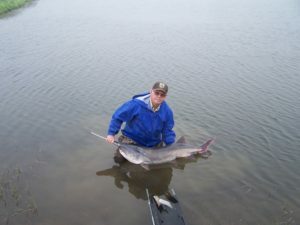 It is also sometimes called a Spoonbill or Spoonbill Catfish, although it is not a catfish. The name paddlefish comes from the Greek and Latin words meaning “many teeth” and “spatula”. Despite its size and rather ominous appearance, the paddlefish actually has no teeth and feeds mostly on plankton by swimming through the water with its mouth held wide open to filter out food with its gill rakers. The “skeletons” of paddlefish are primarily composed of cartilage. The only bone in the fish’s body is the jawbone. 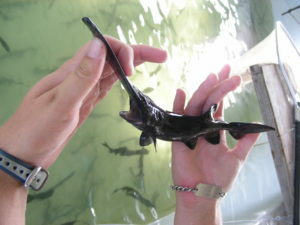 The paddlefish grows up to 7 feet long and its flat, bladelike snout is about one-fourth to one-third its body length. The fish can weigh as much as 200 pounds. Paddlefish can live for 20 to 30 years. Males reach sexual maturity at the age of 4 to 9 years; females at 6 to 12 years. Females can release up to 600,000 eggs after migrating to spawning grounds in early spring during high flows. Females gather in schools and release their eggs in the fast flowing waters over gravel or sandbars. Paddlefish can live in the slow moving waters of rivers and reservoirs. The native range of paddlefish includes the Mississippi River basin from New York to Montana and south to the Gulf of Mexico. Historically in Texas, paddlefish also lived in all East Texas rivers, including those in the Red, Sulphur, Cypress, Sabine, Neches, Angelina, Trinity and San Jacinto river basins. Once common in these rivers, loss of habitat due to construction of dams, over harvesting and other activities have greatly reduced the number of paddlefish in Texas. Paddlefish are now listed as a Texas threatened species and it is illegal to catch, kill, or harm a paddlefish in the state’s waters. There is one other paddlefish in the world, the Chinese Paddlefish, which allegedly can grow to over 20 feet in length and weigh as much as 1,100 pounds. It is also at risk and listed as endangered in China. With the new provisions for more natural flows from Lake O’ the Pines and with the placement of a new gravel bar in Big Cypress Bayou for a spawning area, CLI’s experimental recovery program for the Paddlefish is now possible. 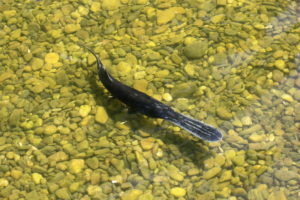 Restoring adequate habitat for paddlefish could also help with the recovery of other aquatic species whose numbers have been reduced by construction of dams or other activities in the watershed.